A contender for the weirdest fighter ever award, Zangefool Fighter 20XX takes on the classic Mortal Kombat/Street Fighter formula and offers a cast that is comprised of “acceptable” to “what the hell? !” fighters. Sure, you have the attractive anime schoolgirl type (Cerica, Mira and Haruka), but it’s when you see fighters such as wireframe Zangef and Keso that things start to look weird. 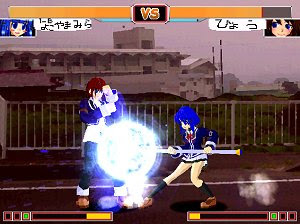 There’s no coming back to normality when you fight with Onboro, a skull mounted on a rickshaw or something, or when you leave the cartoon looking fighters and choose Tomokazu, a 3D depiction of a real person that could well be the author of the game. Although some of them are completely surreal, the fighters in Zangefool Fighter 20XX generally move in a smooth manner, there are some interesting combos, special attacks and such. Fans of the genre should try this different freeware beat’em up game.